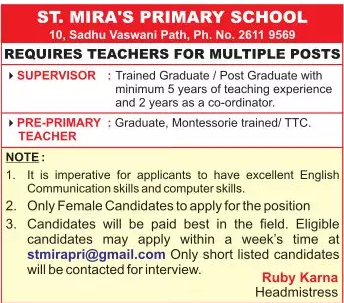 St.Mira's Primary School, Pune has advertised in Loksatta newspaper for the recruitment of Teachers jobs vacancies. Interested and eligible job aspirants are requested to apply within a week. Check out further more details below. About School: The Mira Movement in Education was born out of the vision of a philosopher and an educationist- Sadhu Vaswani. Himself a distinguished Professor and Principal of prestigious institutions, Sadhu Vaswani was a visionary who believed deeply in the cause of woman's education, long before feminism was even thought of. He founded the St.Mira's School in Hyderabad Sind in 1933. After the partition, Sadhu Vaswani selected Pune as the headquarters for his work, as also for the School. The High School was started on March 1, 1950. Soon after,St. Mira's Primary School was started in 1952, with a mission of making every child a gift of God and a pride to the human race.